Some 1,300 people, including dozens of refugees, marched in Tel Aviv on Friday morning as part of a protest against the government's plan to set up a detention facility for infiltrators. They were joined by dozens of children from local schools. "You told us not to forget and not to forgive, but we have forgotten," chanted the protestors, some of whom were carrying a yellow patch with a Star of David. "Netanyahu, don't be a racist," they said. "We are asylum seekers, not work seekers, and we need protection," the representative of the Eritrean refugees' community told the audience. "We don't need another prison, because we have come from a prison." Mubarak Salaa, a Darfur refugee, took the stage and told his story. "When I was in Sudan, people entered my village, burned it down and killed the residents, raped the women and took all our property. My parents told me I should escape, and after a long road I reached Israel, with nothing." Turning to the decision makers, Salaa pleaded: "I want to tell the government that we are sick and tired of being called terrorists and the State of Israel's diseases, and of people saying we have come to work and take Israel's money and return home. It's not true. "I thought Israel was a democratic country and the only one which could help us until there is peace in Sudan. I ask that we be allowed to stay here until we can return to our country." Representatives of the refugee community, former Tel Aviv mayoral candidate and Knesset Member Dov Khenin (Hadash) and former MK Zahava Gal-On (Meretz) were also expected to speak at the rally. The migrant workers' aid organizations say the open detention facility, which will be built near the Israel-Egypt border, will serve as a "ghetto" for infiltrators. Inbal, a schoolteacher, explained that the children's protest was part of the human rights week marked in the school. "The person who initiated the idea to protest together with the refugees was a third grader who read about it in the newspaper," the teacher said. "The refugees have rights too – that's why we joined this protest," said 10-year-old Shira. Tommy Bera, 28, who arrived in Israel from Eritrea, said he left a wife and child behind. "My entire life in Eritrea was spent with prison. So if they send me to a detention facility in the south, what difference does it make if I'm in Israel or Eritrea? My visa became invalid a month ago, so no one agrees to hire me. I want to be an Israeli like you, but it's seem we're not wanted here." 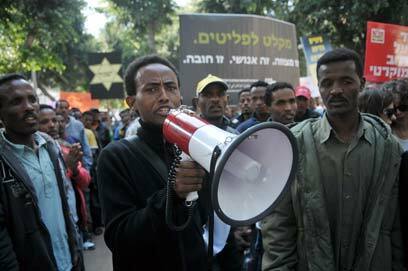 Former MK Gal-On told Ynet earlier that "the refugees from Sudan and Eritrea should not be thrown into jail. Our nation knows what it means to be refugees, and we have a moral and historic duty not to throw the refugees out and not to abandon them." Gal-On accused Prime Minister Benjamin Netanyahu of using a "revolving door" method. "Instead of taking care of the refugees that are already here, the government brought in 25 times more than we already had. The claim that they are threatening workplaces is incitement and is expressed in anti-infiltrator protests." Hundreds of southern Tel Aviv residents marched in the city this week, calling on the government to "send the infiltrators home". The protestors said they had been abandoned by the government, chanted "Bibi, resign" and claimed that the refugees were increasing the level of crime in their residential area. Tel Aviv Councilman Arnon Giladi, of the Likud faction, called to deport the infiltrators to Egypt. "Let them go back and work in Egypt," he said. "This is a national disaster, it's an invasion and even if the fence is built, what will we do with those who are already here," lamented Tzvi Galboim of Ashdod. See all talkbacks "Refugees: We're not Israel's diseases "